....and buy a pick-up, take it down to LA". OK, so I know it's not a pick-up but there's a few of reasons why I had to use this title. I've been listening to Harvest by Neil Young all week. 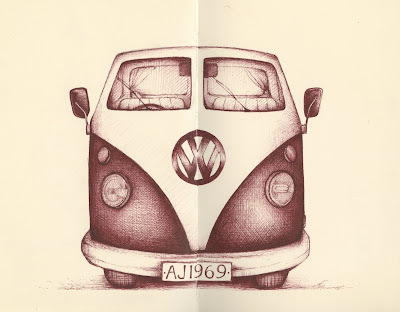 A classic album to go with this classic camper van. This is one of my all time favourite openings to a song. Actually, not only is it the opening to the song but to the whole album. I hear those words and get tingles. In my life I've always felt this way. Like packing it all in, buying a pick-up and heading for the refuge of the roads. I've never been able to shake that feeling off. I'm going away for a few days too, so actually I am taking to the road (I'm not going to LA though). Don't know if' I'll get a chance to post much this week but hopefully I'll get some drawing done. Finally, a few weeks ago an old friend found me through the powers of the internet. We'd lost touch and not seen each other for about 10 years. I told her that I wasn't the old hippy she known back then, I'd really changed. Hmmm. She didn't believe a word of it and after this post I think she may be right. Ooops, I haven't quite finished yet! It's a bit of a rubbishy drawing but it's my first vehicle. Inspired by France Belleville (I wasn't brave enough to do a side view - it's the wheels that scare me off drawing cars) who coincidentally made this post yesterday; Neil. Cheers everyone, see you when I get back to town. (Click on image to view) I was absolutely convinced that I had already drawn a pinboard. I'm still surprised that I haven't - I mean, it's so me! This, once again, was going to be a little 'light relief' in between drawing buttons. It's taken me about a week! ALL week. I really don't want to draw those buttons it seems. It doesn't look like I'd pictured it in my head and the sizes of the objects are all out of proportion. But none of that matters because I really really loved drawing this subject. I'm going to give it another go too (I know) maybe with a little colour. 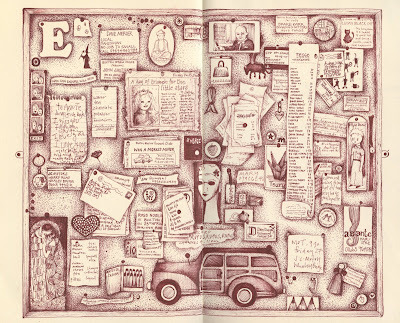 Lots of notes about this drawing on Flickr. Check it out HERE. A quickie here. 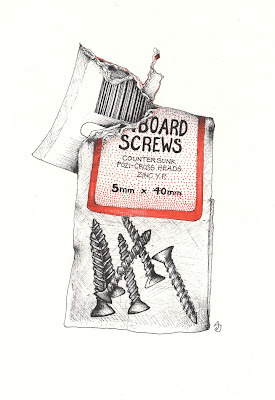 I've got a screw loose; I'm starting another buttons drawing. So I may be getting lost in that over the next few days...well nights...late nights....late late nights. See you on the other side. I was cleaning out the car the other day - well, I say 'cleaning out' actually all I did was gather these tapes together - which got me reminiscing. 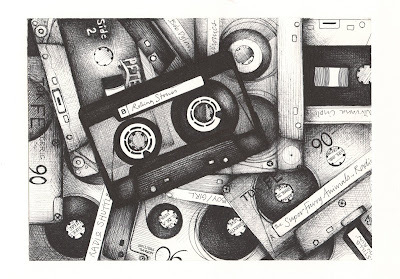 I think I probably spent the entire of my teenage years compiling play lists on cassettes. I loved making compilations, always trying to get all of my very favourite tracks onto one tape. But favourites come and go just like lovers and styles of clothes (sorry, I had to do it. I had been working up to that line) and, of course, the way we listen to our music. I am sad to let go of some of these old friends but we've come to the end of the road. It's over. I'm using this one for Everyday Matters challenge #61, draw a grouping of similar objects. Have another banana. 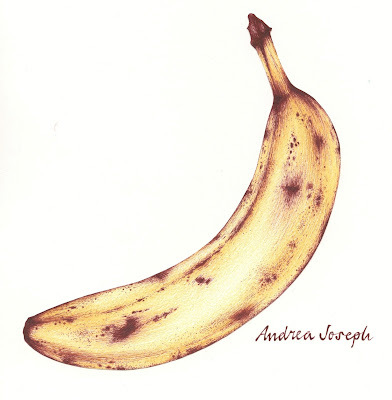 A few people commented on how my last drawing bore a resemblance to Warhol's iconic artwork for the cover of the Velvet Underground's brilliant album. I had to agree. It was not intentional, I didn't even notice the resemblance until I'd uploaded it. This, however, was intentional. 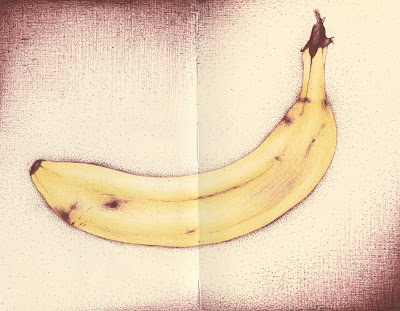 It is also the same banana as in the last post, just a couple of days older. For those who are not familiar with that album check it out HERE. Back in the Moleskine sketchbook, I haven't used it for a long time. I'd forgotten how good the paper is. 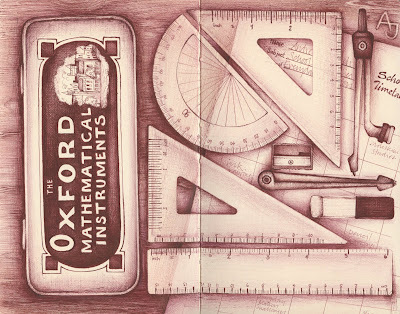 This drawing is my response to Everyday Matters Challenge #130 'draw some school supplies'. Oh, and don't tell the teacher but I carved my initials in the desk with the compass. For those who don't know (and who have asked me recently) Everyday Matters is an online drawing group. They set weekly challenges and you can see that list HERE. You can see the Everyday Matters challenges that I have completed HERE. This was one of the drawings that I got really frustrated with last weekend. 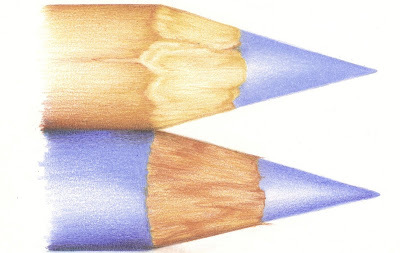 It was originally meant to be three pencils, and was going to be for Illustration Friday's 'the Blues' theme. Anyway one of the pencils went wrong which explains the pretty bad crop. I haven't really got the blues inside my head (today), it's just a great line. And, I'm trying to see how many times I can quote Joni on this blog. I'm averaging about once every other post. Tubes of stuff (click on image to enlarge). 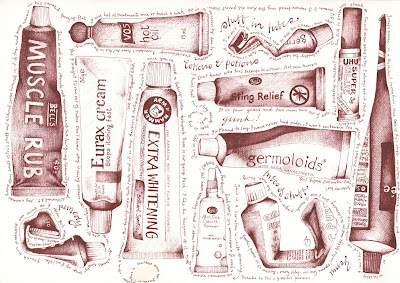 It's when you find yourself drawing hemorrhoid cream that you know that you need to ask yourself some questions. What am I doing with my life? Is this normal behaviour? How did it come to this? 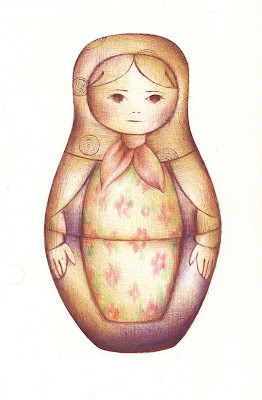 This is the mother of the Russian doll family that my late grandpa bought for me, from a trip to Moscow, many years ago. Unfortunately the rest of her family is a little fractured. Some are half the people they used to be while others have completely lost their heads. Families, eh? I really didn't want to post this as it's a bit rubbish. I'm in a right old drawing funk at the moment. I've had a very frustrating weekend. Even though I've been drawing and drawing I'm just not happy with any of it. She's the best of a bad bunch.